Besök Hoover Dam och njut av en båttur på Lake Mead under den här fulldagsutflykten från Las Vegas. Resa till Hoover Dam med din expertguide för att lära dig om dess historia och inre arbete. Besök Nevada-vingen på kraftverket och granska skärmarna på Visitors Center. Ta en 90-minuters kryssning på Lake Mead, där du kan njuta av lunch ombord. Stanna vid den legendariska Ethel M Chocolate Factory på din resa tillbaka till Vegas. Inklusive alla lokala skatter och avgifter! En ångbåtstur på Lake Mead ger ett annat perspektiv på dammen för en förbättrad upplevelse. Efter morgonhämtning på ditt hotell i Las Vegas, gå ombord på en lyxmotorbuss och köra till Hoover Dam. Vid ankomsten, starta på Discovery Tour, som omfattar en prospektering av flera områden och varar ca 2 timmar. I utställningsgalleriet visas vyerna på områdets naturhistoria och dammens driftshistoria. Vandra genom väggmålningar, kartor och visar på teaternivån som dokumenterar historien om Hoover Dam. Titta på hur väst var won, en kort video som beskriver Bureau of Reclamations del i att odla mat och tama floderna och öknen. Rid en hiss 500 meter (152 meter) ner i Black Canyon väggar och gå igenom tunnelbanan på 250 meter (76 meter) borrad av sten. Besök de 8 generatorerna i Nevada-vingen på kraftverket. Lämna dammen och fortsätt till Lake Mead Marina. Styr Desert Prinsessan, en paddla-hjul ångbåt och din vagn för 90-minuters rundtur i Lake Mead. Njut av utsikt över dammen från den här vattnet, när du gräver till en deli-stil lunch. Efter avslutningen av din sjöutflykt, klättra ombord på motorbussen och gå tillbaka till ditt hotell i Vegas. Efter avslutningen av din sjöutflykt, klättra ombord på motorbussen och gå tillbaka till ditt hotell i Vegas. Stanna vid Ethel M Chocolate Factory och (om tiden tillåter) tecknet "Welcome to Las Vegas" för ett foto op. Wait at terminal was slow but the excellent driver made up for it! We were supposed to arrive at Lake Mead for the 12pm boat tour with lunch and other tour members were going to the Railroad Hotel for their lunch then on to Hoover Dam for the tour there around 3pm, never happened. To begin with the tour was overbooked, lost at least 1/2 hour, then we went to a location for people to take a picture of the Las Vegas sign, should have been done on the way back from the dam, next stop was Ethel M's chocolate factory, lost more time there, finally ended up taking the 2pm boat tour which was good but by the time we got off the boat and ready to head for the dam tour it was closed. The whole day was a convoluted, disorganized, disappointment, UGH!!! Picked up at the hotel and went to the Grayline main area to be assigned busses. Because Grayline had overbooked our tour they needed 6 people to volunteer to rebook on another tour...took 1 1/2 hrs before we could leave. Sight stops were rearranged to where we didn’t have enough time to tour Hoover Dam because of the cruise cutoff time. We did make the cruise. Total time on the tour was approx. 6 vs 8 hrs which we paid for. Professional and friendly driver. Terrific experience on Lake Meade and seeing Hoover Dam from the different viewing sites. We booked this tour to see the how the dam produces electricity. AFTER we arrived at the Gray Lines Welcome Center, we were told that the very part we wanted to see was unavailable to tours and had been unavailable for months. We feel cheated. Also, there was not enough time at the dam to see what was there. deli lunch on the boat was so bad, I had to buy my own meal. Bad, bad, bad all the way around. IT was a hurry up and wait to see what you could not see. What a joke! 99 per person 11 all total: rode the bus, made several stops. Got to Dam, looked around the visitor center, went to the bathroom, drank water, seen a short clip of the Dam, stood on the bridge then got back on bus to drive back to room. Horrible time especially for the grandkids. I could have rented a Van, drove to the Dam, walked around then drove to Lake Mead Marina, bought the tickets and saved over 400. Very disappointing trip all the way around. Trip was amazing from pick up to drop off. Driver and narrator knew his Vegas history and made it a fun and interesting drive. Views of Dam were amazing and would go on this tour again. Well worth the money! I picked this tour because my brother wanted to see the inside of the dam and I knew he would love the lake cruise. I booked June 5, and when we arrived at the Gray Line office we found out that because of repairs on the elevators we would not be touring the inside of the dam!!!! Think we should have been told that before we arrived and been given a chance to cancel or pick another tour. Great experience with Gray Bus Line Tour. Our bus driver Mark was very informative and friendly. Gray Bus Line was efficient by E-mailing and texting confirming pick up time and where they would pick you up Two things were disappointing the elevators at the Dam were under construction so couldn't do that part of Tour showing how the Dam operates. 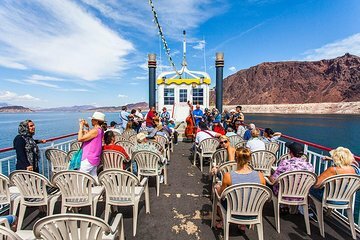 The Lake Mead Cruise was enjoyable but disappointed that we couldn't go into Canyon to see Hoover Dam it was too windy that day and would be dangerous. Unavoidable. Sandwich for lunch could have been better. Chocolate Factory should be deleted from Tour. Only there 20 minutes. Would definitely recommend Gray Bus Tour.